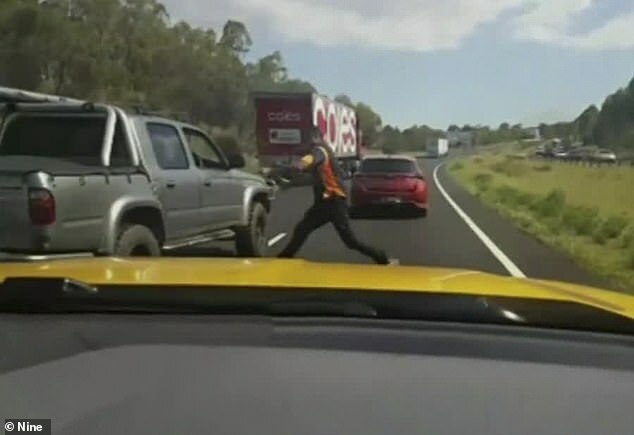 A driver was horrifically stabbed in the stomach in front of his wife and children during a violent road rage attack on Friday. 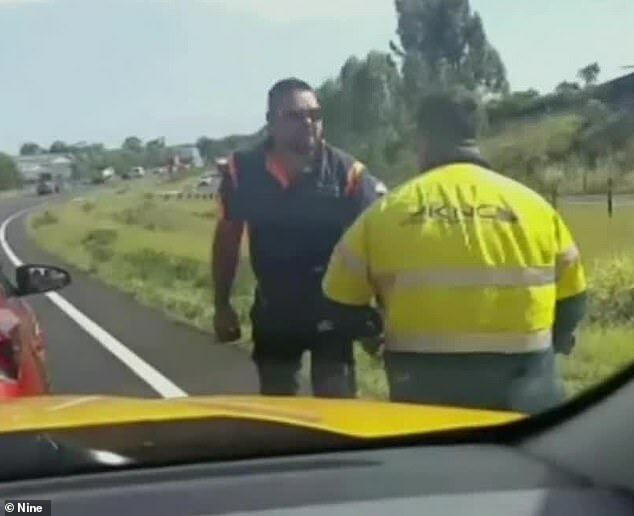 Footage obtained by Nine News shows two drivers in a heated argument on the M7 motorway in Sydney about 4.15pm. ‘Who the f*** do you think you are?’ the driver of a Toyota Corolla, who is dressed in a hi-vis vest, can be heard yelling at the other man. ‘And what? And what?’ responds the 42-year-old Hilux driver. During the attack, the Hilux driver was stabbed in the abdomen as his wife and child watched on in fear. The alleged attacker in the hi-vis vest is accused of then jumping into his car and driving away. The injured driver yells for his wife and child to get into the car before trying to drive himself to hospital. He was forced to pull over and be treated by paramedics. Police believe the attack began when the man in the hi-vis vest threw an item out of his car window. ‘It appears to be completely random at this stage, but bear in mind but we’ve only spoken to one party at this stage,’ Acting Inpsector Steve Vuletas told the media. Anyone with further information or recognise the man is urged to contact Crime Stoppers.